BIENVENUE À BUTTERFLY HAVEN LODGE - DIEU DE 12 personnes confortablement dans 4 chambres! Remarque: S'il vous plaît prendre une visite virtuelle afin que vous puissiez regarder de plus près à Butterfly Haven Lodge! Appelez Chase (Property Manager) si vous avez des questions! Du 1er avril au 31 octobre, toute location d'une semaine de Butterfly Haven Lodge - 7 jours / 6 nuits pour seulement 2 399 $! Du 1er novembre au 31 mars, toute location de semaine complète de Butterfly Haven Lodge - 7 jours / 6 nuits pour seulement 1 899 $! Nous sommes la destination idéale pour les rassemblements familiaux toute l'année, les retraites de l'église, les voyages d'exploration nature de la mère et la fille, la construction d'équipes corporatives, les escapades d'amie et les réunions de famille. Vous pouvez vous relier à votre famille et à vos amis ou à vous et à cette personne spéciale! Lounging sur le pont en regardant la belle forêt, en vous relaxant dans le spa ou autour du feu de camp, votre séjour à Butterfly Haven Lodge est garanti pour être l'un de ces moments que vous souhaiterez ne finira jamais. Que votre idée de vacances parfaites soit en train de voler d'un arbre à l'autre sur le meilleur cours de télécopie dans le Midwest, se rapprochant de la vie sauvage et de la vie sauvage, met en évidence votre endurance et vos sentiers panoramiques à travers les parcs et les forêts, une visite panoramique panoramique ou Un ballon à air chaud, un canoë, de la pêche et bien plus encore, Hocking Hills est l'endroit idéal! * Super endroit! Seulement 2. 5 miles de Cantwell Cliffs et à moins de 10 minutes de la Hocking Hills Canopy Tours primé! * Près de Rock House, Conkle's Hollow et Rockbridge State Nature Preserve! * S'appuie sur plus de 10 acres de belle forêt! * Atmosphère très confortable avec un mobilier confortable! Tellement proche de toutes les attractions locales de Hocking Hills, vous serez encore à quelques kilomètres! We stayed at the Butterfly Haven in Hocking Hills Ohio. This was for our 33yr wedding anniversary with Family and Great Friends! This place was AWESOME !!! We had so much Fun we're already thinking of our next getaway. The place was amazing and served our family very comfortably! Nice and clean! Loved it! 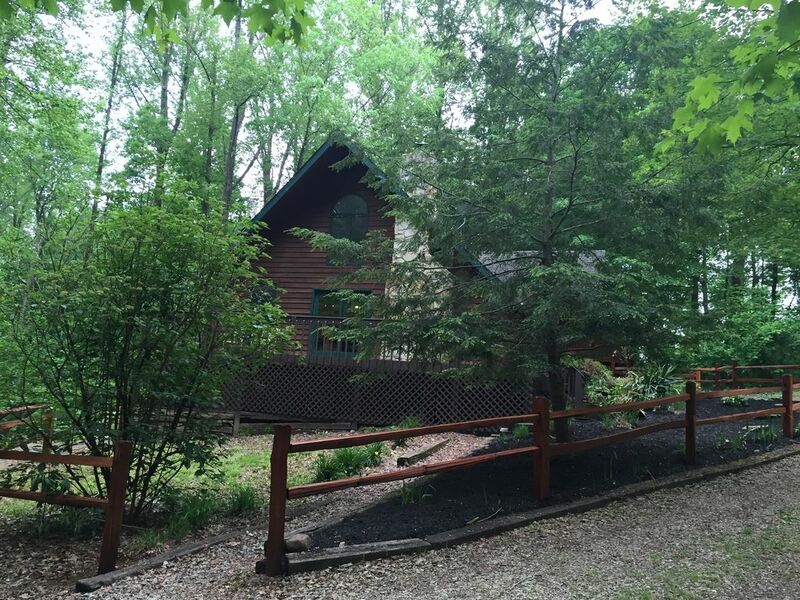 It is a beautiful cabin located on a beautiful wooded piece of property. The cabin was well stocked with everything in the kitchen that you would need to cook with. The bedrooms were spaced throughout the cabin so you could have privacy. The bathrooms were all very nice. The family space in the basement was great, we could all gather down there after kids went to bed, so we wouldn't wake them. The cabin was very nicely decorated. It had a homey feel to it. My husband and I and our 2 adult kids with their children had a great time. Close to Logan if you would like to go shopping or out to eat. There were just a couple small issues. There was not enough toilet paper. It states that there are supposed to be 2 rolls in each bathroom. There was not. We had to go buy some. Also, we had to buy trash bags. 3 trash bags for 6 people and a baby were not enough. We cooked all of our meals at the cabin. The hot tub needs to have some chemicals applied to it. The water smelled very musty. We would stay in this cabin again! Girls trip with 7 wonderful women. We make a trip to Hocking Hills every year and we all felt this was by far the best place we have stayed! The dining table was large enough for us all to sit comfortably. The kitchen is fully stocked with everything you need. We did have to pull in a couple extra chairs in the living room, but we’re use to that. The trash cans were nearly full outside so we called shortly after arrival and had an additional can within the hour. The drive was covered in snow and ice but we went mid-January so this what you can expect when you travel in Winter. It did create a bit of a problem getting in/out due to the hilly drive, but we managed. The house was very clean and cozy. We had a great time with the ping pong table and piano. We didn’t utilize the hot tub, but it was ready for our use and covered. Overall, we were very impressed with the house, the amenities, but most importantly, the prompt response by the owner with the trash can situation. We are strongly considering a return visit. The only reason we wouldn’t return is because if the timing of our trip in winter and potential for bad weather. Unfortunately we are stuck with a winter trip due to scheduling issues and the road conditions are a concern. This has no bearing on the house, just whether we want to deal with the weather conditions in the area. Highly recommend! We really enjoyed our New Year’s weekend at the Butterfly Haven. It was very clean. The kitchen was well stocked with pots and pans and cooking utensils. This is rare. I’ve gotten used to bringing my own because we do cook a lot. Also, there were plenty of nice towels in each of bathrooms. The cabin is close to Logan and to the trailheads. It’s privately situated on a beautiful wooded lot. I really appreciated the Christmas Tree and all the lights as we were doing a holiday gift exchange with friends. We would definitely rent this cabin again. Thank-you! We thoroughly enjoyed our stay over Christmas week. The only complaint we have is the rodent problem. I know it is nearly impossible to keep them out being located in the woods. If the group coming in does not include small children, maybe some mouse traps could be put out. We had to wash the utensils in the drawers a couple of times because of mouse droppings. The cabin otherwise was very clean, plenty of room for our family of 10 to spread out. The decorations that were put up were great and so welcoming. We really appreciated the generator on Thurs. was a very welcome addition as we lost power for several hours that night. We used the fireplace every evening and loved it. The hot tub was great and we used it several times. The kitchen is very well supplied and we had everything we needed. We would recommend this rental to families. It was a great week!!! !